At a time when issues of sexual harassment and consent are in the news, and with the holidays just around the corner, the Girl Scouts have released a recommendation about how parents can help young girls handle affection. A "Reminder" post on the GSUSA website tells parents, "She doesn't owe anyone a hug. Not even at the holidays." The "hugs" here are obviously of a non-sexual nature: Doting aunts and grandparents who are inclined to big embraces and cheek pinches at holiday gatherings. However, the GSUSA's post says this could set the stage for unexpected emotional consequences. "Think of it this way, telling your child that she owes someone a hug either just because she hasn't seen this person in a while or because they gave her a gift can set the stage for her questioning whether she 'owes' another person any type of physical affection when they've bought her dinner or done something else seemingly nice for her later in life," the piece reads. It also offers insight from Girl Scouts' developmental psychologist Dr. Andrea Bastiani Archibald, who says letting girls decide when and how to show affection, even to family members, can help with "setting physical boundaries and expecting them to be respected" even as they get older. While some people waved away concern on social media or accused the Girl Scouts of blowing an innocent family interaction out of proportion, others pointed out that this has long been a (very controversial) topic in parenting circles. After CNN's Katia Hetter wrote an article advocating for such a practice in 2015, readers responded with various opinions. Some shared difficult stories from their childhood that they carried with them well into their adult years. "I raised my children this way over 20 years ago. Why did we do this? Because I had been a victim of sexual abuse by a family 'friend' for many years as a child. I did not want my children to think they had to hug or touch others unless the contact was wanted," one reader wrote. Others didn't understand the big deal, and argued that family obligation sometimes means doing uncomfortable things. "You're damn right you're going to hug the woman who gave your mother/father life so you could have life," another reader wrote. 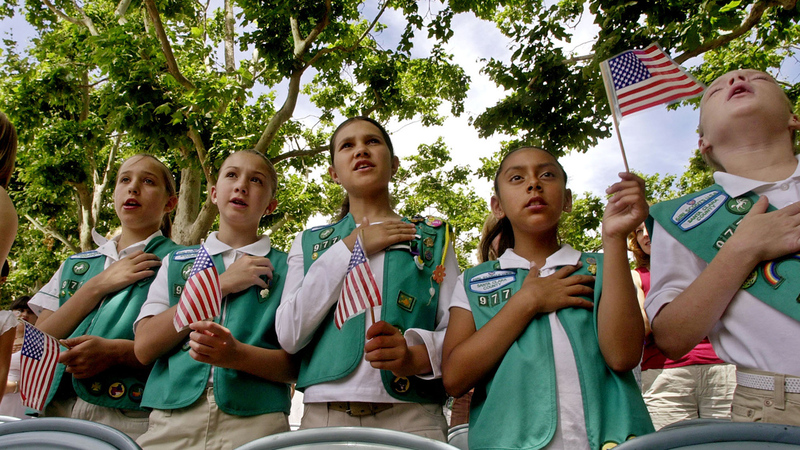 The Girl Scouts have a history of taking on polarizing subjects regarding girls, women and gender identity. Over the past few years, parishes and religious groups have made public splits with the organization because of the GSUSA's "secular" interests.